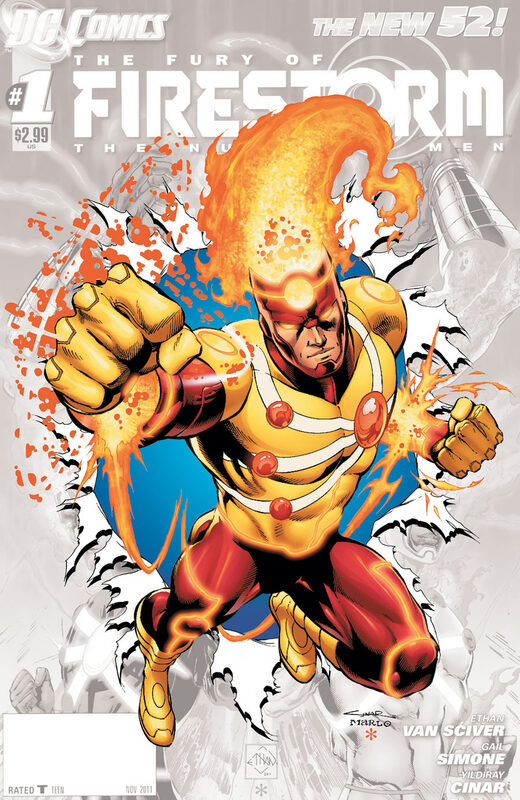 DC Comics will release The Fury of Firestorm: The Nuclear Men #0 in September. Based upon the cover and solicitation, this looks like a great jumping-on point! Let’s spread the word and get new readers and old Firestorm fans alike to pre-order this book! Based upon past sales figures, it seems feasible that Fury of Firestorm might be at risk for cancellation if sales don’t improve. We don’t have any evidence to back up that assumption, but it seems like a reasonable thought. The best way to ensure we continue to get Firestorm monthly is to increase sales. Issue #0 seems like our best chance to increase those sales numbers! Comic companies base a lot of decisions on orders from comic shops. Quick education for you… Most comic shops in the U.S. order their issues from Diamond Comic Distributors two months in advance. Which means comic shops will place their initial orders for The Fury of Firestorm: The Nuclear Men #0 sometime in mid-July. DC Comics will receive the orders from Diamond Comic Distributors (and other comic distributors) and know how many issues to print. DC Comics will also use this order information to make business decisions, such as which titles to cancel. So you can see how important pre-orders are for a comic’s success. Please pre-order your copy of The Fury of Firestorm: The Nuclear Men #0 with your comic shop no later than July 18. The more copies ordered by comic shops, the stronger message we can send to DC Comics that we’ll support a monthly Firestorm comic! I know there are lots of old school Firestorm fans not reading the current series. From what I’ve heard, many of them miss the classic Nuclear Man. Well, if you look at the cover to issue #0, it certainly looks like a story that might interest them! Please help spread the word to these lapsed Firestorm fans to pre-order issue #0! Check out the fantastic cover below by Yildiray Cinar, Marlo Alquiza, and Hi-Fi! Click the image to enlarge! Jason Rusch and Ronnie Raymond try to return to civilian life after losing the power of the Firestorm Protocols…but when danger threatens them, will they be able to survive? Is this the end of Firestorm? In addition to pre-ordering your own copy, please help spread the word! We want anyone that has ever enjoyed a Firestorm comic to pre-order issue #0 and give it a try! Use Twitter, Facebook, Tumblr, Google Plus, Linked In, Pinterest, Reddit, Digg, StumbleUpon, smoke signals… whatever. Just spread the word to pre-order Fury of Firestorm #0! Support Firestorm! It’s not just slogan! Seriously, SUPPORT FIRESTORM by pre-ordering this issue! Fan the Flame! Posted in: Comic books, Firestorm #09: New 52 v1 (Firestorm Protocols), Firestorm comic vol. IV, Jason Rusch, Joe Harris, Ronnie Raymond, Yildiray Cinar. • New series writer/penciller Dan Jurgens blasts Firestorm in a whole new direction beginning this issue! **please note, while i’m doing a personal boycott of this mess of a series, I LOVE your website, keep up the great work. Good post. I agree that most people show pre-order the books they love in order to more fully show their love for the character. It may be too late for me to pre-order it for myself but THIS is the issue that DC has a shot to get me back into one of my favorite characters within the DCU. Having the ORIGINAL looking Firestorm back goes a LONG way to making this series something I’ll stay interested in consistently. You already know my feelings on this iteration of the franchise, but here’s to number zero for taking a chance at bringing back the old school fans! And all is not lost, while keeping a Firestorm series alive is important for match heads everywhere, Dan Didio has said multiple times that, if a series is cancelled, DC makes an effort to make sure the character appears in other titles. So it shall not be the end of Firestorm!